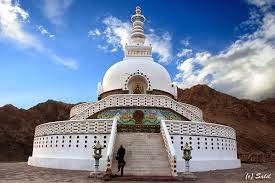 Shanti Stupa is a Buddhist white-domed stupa (chorten) on a hilltop in Chanspa, Leh district, Ladakh, in the north Indian state of Jammu and Kashmir. It was built in 1991 by Japanese Buddhist Bhikshu Gyomyo Nakamura . The Shanti Stupa holds the relics of the Buddha at its base, enshrined by the 14th Dalai Lama himself .The stupa has become a tourist attraction not only due to its religious significance but also due to its location which provides panoramic views of the surrounding landscape.The Shanti Stupa was built by both Japanese Buddhists and Ladakh Buddhists. Original idea was stated by Nichidatsu Fujii (Fujii Guruji) in 1914 The mission of Nichidatsu Fujii was to build Peace Pagodas and temples over the world and try to resurrect Buddhism back in India.Construction of the Shanti Stupa began in April 1983 under the supervision of Bhikshu Gyomyo Nakamura and Kushok Bakula, a lama of Ladakh from New Delhi, member of the Minority commission of Govt of India, former statesman and former international diplomat of the Republic of India. The project was built with the help of Ladakhi Buddhists, who offered voluntary labour, and Japanese Buddhists, who consider India as the "sacred" birth place of the Buddha Then prime minister of India, Indira Gandhi, sanctioned the construction of a vehicular road to the stupa in 1984. The state government also provided some financial assistance for the construction of the Shanti Stupa. The 14th and current Dalai Lama, Tenzin Gyatso inaugurated the Shanti Stupa in August 1991.